"This is an extremely easy recipe that can be baked in a conventional oven or in a slow cooker. 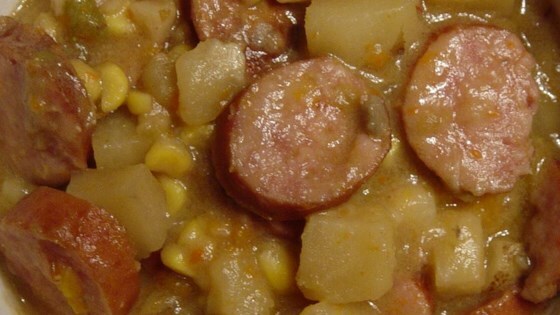 It combines potatoes with kielbasa or sausage baked in a creamy mushroom sauce." For oven: Preheat oven to 350 degrees F (175 degrees C). In a 4 quart casserole dish, combine the potatoes, kielbasa OR sausage, mushroom soup and vegetable beef soup. Mix together well. For slow cooker: Place the potatoes, kielbasa OR sausage, mushroom soup and vegetable soup in a slow cooker. My boyfriend and I loved this recipe. It was very easy to make, although I might recommend spraying the baking dish with cooking spray before baking.